The Orthodox archbishop of the island emphasizes the importance the encounter between sister Churches and calls to order the two metropolitans who have spoken out against the presence of Benedict XVI. Chrysostomos seeks support for a peaceful solution to the division created by the Turkish invasion. Father Lombardi: the message Benedict XVI, in particular, that of peace and prosperity for the people of Cyprus and the Middle East. Nicosia (AsiaNews) - Tomorrow the first visit to Cyprus of a pontiff begins, at the invitation of the Archbishop of Cyprus Chrysostomos and President Christofias. There the Pope will meet the faithful belonging to the Maronite Catholic Church and Armenian Latin rite Church and deliver to the bishops of the region “Ιnstrumentum laboris”, the working document for the synod of bishops dedicated to the Middle East to be held in October in Rome. The director of the Vatican Press Office, Father Federico Lombardi, in an interview with Aris Viketos, published today the most important newspaper in Cyprus, Filelefteros, has termed it a visit of great importance with many meanings. Above all it is the first visit of Benedict XVI to a majority Christian Orthodox country. Cyprus is not only a crossroads, said Father Lombardi, a bridge between Europe and the Middle East, but was also a very important land in the life of the early Christian community (referring to St. Barnabas and St. Paul) and for centuries has been linked to the Holy Land, so beloved by Christians. The meeting with the Orthodox Church of Cyprus is essential. The trip will be characterized by signs of fraternal friendship in the common commitment to seek full unity among all Christians, as both churches are committed to ecumenical dialogue. Dialogue between Catholics and Orthodox began again, after years of deadlock, in Ravenna in 2007 and on this very island in the autumn of 2009. The encounters were chaired by Cardinal Walter Kasper and Metropolitan Ioannis Zizioulas of the Ecumenical Patriarchate. Of course, Father Lombardi stresses, the choice of Cyprus to present the preparatory document of the Synod of Bishops of the Middle East is a clear sign that the Pope considers Cyprus a privileged meeting point for Christians of the region and certainly wants to speak not only to Catholics but to all inhabitants of the region including those of other religions, Muslims and Jews, as part of the Catholic Churches commitment to human and spiritual development and a dialogue that builds peace. 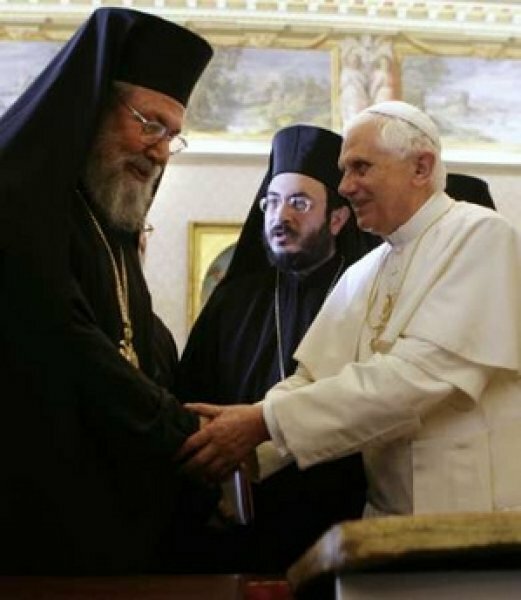 On the same wavelength an interview given yesterday by the Archbishop of Cyprus Chrysostomos (pictured: his meeting with the Pope in Rome in 2007), to Aris Viketos, who described the visit as one of great importance for the Orthodox Church of Cyprus, as it will strengthen ties between the two Churches and consequently dialogue. All Orthodox Churches, continued Chrysostomos recognizes the Church of Rome as a sister Church and thus its leader, the pope. "The will of God consists in loving your enemy, and more so your brothers." The archbishop went on to say that he would ask the Pope's support for a just solution in Cyprus, and also speak of Christian monuments destroyed in the northern part of the 'Island, still occupied by 30 thousand soldiers of the' Turkish army, "accompanied" by 70 thousand settlers, who have altered the demographic composition of the area. In this regard, Chrysostomos said he was not very optimistic about the willingness of Ankara, given that Turkey has always ignored the pressures of Presidents of the USA to reopen the Theological School of Chalki. Regarding the political situation created on the island, divided since the Turkish invasion of 1974, Father Lombardi added that Benedict XVI’s message is above all one of peace and prosperity for the people of Cyprus, and the desire for a definitive peaceful solution to the painful situation that exists today, excluding a papal visit to the northern part of the island. A visit that the Turkish minister for European affairs, Egemen Bajis, sought in his meeting with the head of the Holy See’s relations with states, Mgr. Dominique Mamberti, given the increased importance the Pope's presence in Cyprus was taking on, and recognizing, as he told the Turkish press that the Vatican may influence the 27 member states of the EU 'to accelerate the entry of Turkey into Europe. Returning to the ecclesial aspect of Benedict XVI's visit, the Archbishop of Cyprus has rebuked two metropolitans, Athanasios of Lemesso and Pavlos of Kirinias who have spoken out against the Pope's presence in Cyprus, threatening fire and flames and finding an ally in the Metropolitan Seraphim of Piraeus, who in turn has threatened a massive landing of "pure" Orthodox believers on the island against the visit. Crysostmos has brought them to order, reminding them to respect their commitments and threatening them with suspension, adding: "I invited them to behave properly and respect the decisions of the synod, which they had initially agreed with”. And the necessary consequences will be met at the end of the visit. The same Father Lombardi, in the interview said that a pair of extreme positions do not represent the views of the community and particular weight can not be attributed to them. And finally, authoritative voices from Athens have also been raised against this meagre fringe, defined Orthodox Taliban, who have no influence in civil society, but who know how to make themselves heard. They accuse the Catholic Church of authoritarianism, say the intellectuals of Athen’s Orthodox circles, while they are the first to implement a feudal behaviour, contrary to Orthodox tradition of collegial respect. The position of the Metropolitan of Messinias Chrysostosmos, professor at the University of Athens is of particular relevance, who described the statements by the Metropolitan of Piraeus as unseemly and unsubstantiated.